“Nice women don’t want the vote,” is a phrase attributed to Manitoba Premier Sir Rodmond Roblin during a heated exchange with suffragist Nellie McClung in 1914. It is also the name of a travelling museum exhibit by the Manitoba Museum. 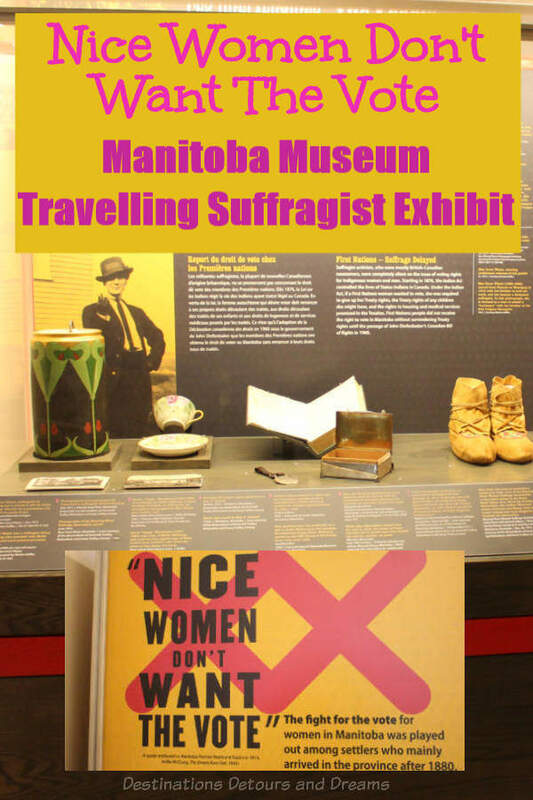 The exhibit was created in 2016 to commemorate the 100th anniversary of women in Manitoba gaining the right to vote. It began travelling the country in April 2016 and is ending its tour back in Winnipeg, Manitoba, Canada at the Manitoba Legislative Building from January 8 to March 31, 2019. 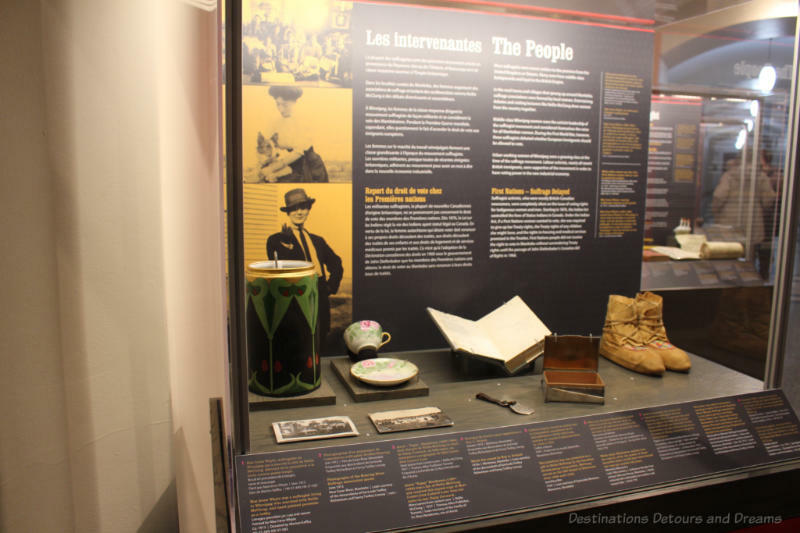 The exhibit contains displays of assorted relevant artifacts, information about specific suffragists and details about the women’s suffrage movement in Manitoba and in Canada. There is also some information relating to other women’s rights, particularly those of property ownership. 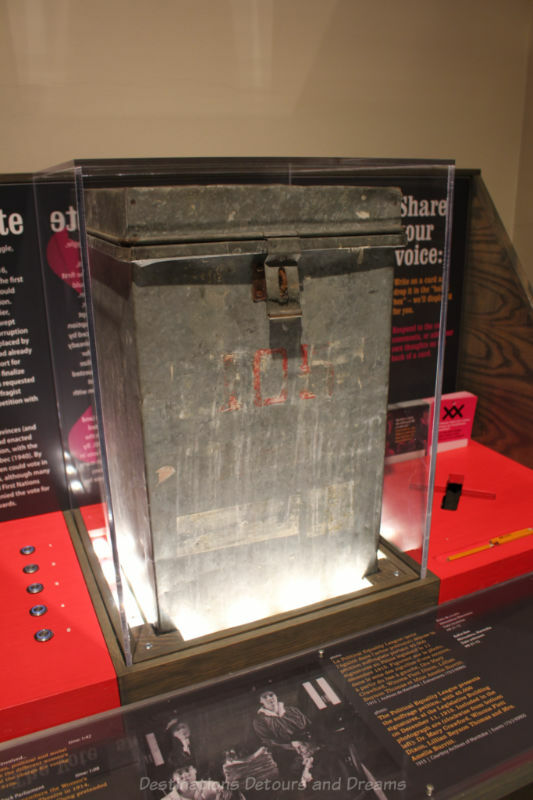 A timeline of key events shows that women in Lower Canada, an area covering what is now southern Quebec and Labrador, had the right to vote, in place since 1791, taken away by a law enacted in 1849. To me, that is a reminder never to become complacent about rights that have been gained. The 1867 British North America Act, which formed Canada, excluded women from the vote by Common Law. In 1887, women in Manitoba obtained the right to vote in municipal elections. 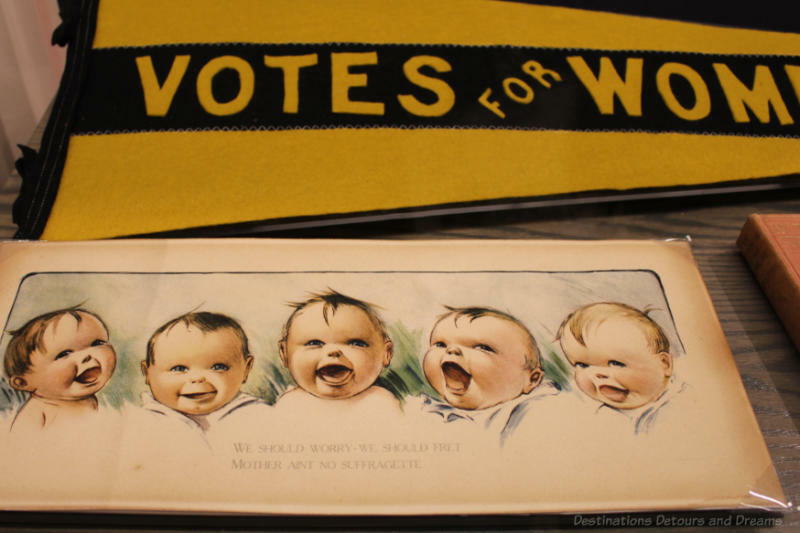 Petitions for women to vote federally and provincially began as early as 1894. In 1916, Manitoba women became the first in Canada to be allowed to vote in provincial elections. From 1917 to 1920, all other provinces with the exception of Quebec, followed suit. In 1920, women were given the right to vote federally with the same conditions as men. Quebec women did not obtain the right to vote provincially until 1940. 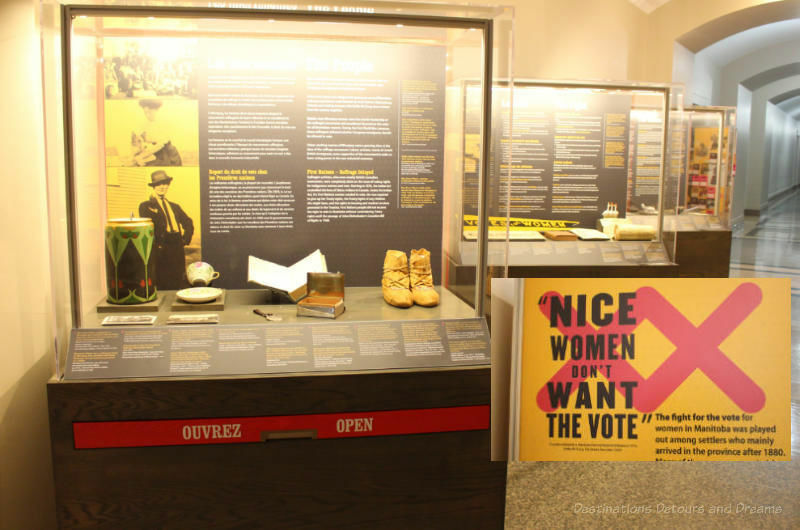 Wording on the entrance placard to the exhibit is as follows: “In 1916, the vote was finally extended to some women in Manitoba.” It is important to note that the right to vote did not extend to all women. Indigenous and many immigrant women still could not vote. Chinese and Japanese persons (men and women) did not obtain the right to vote until the 1950s. If wasn’t until 1960 that indigenous persons (men and women) were allowed to vote federally without giving up their Treaty rights. Suffragists were mostly British-Canadian. For many the right to vote was tied to ideas about social reform. 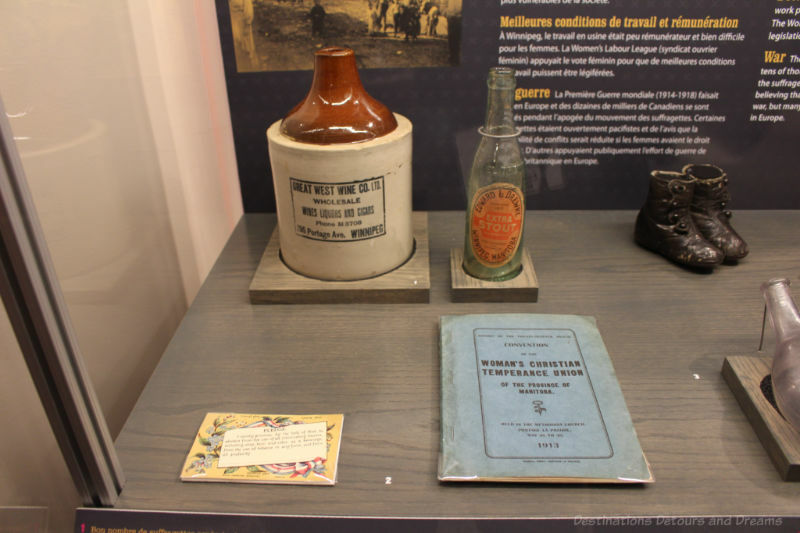 Many were part of the temperance movement to ban alcohol. Activist measures included formation of suffrage associations that hosted debates and lectures, petitions, political theatre, letter writing and editorials. 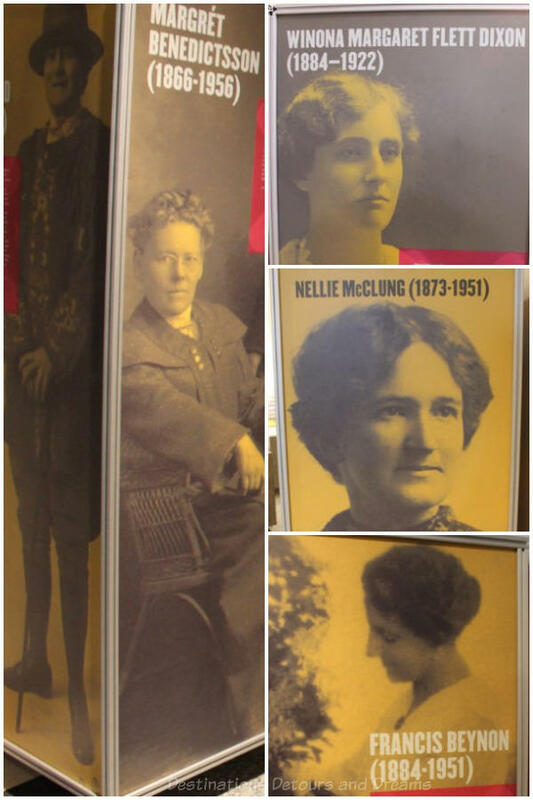 Nellie McClung may be the most well-known of the suffragists. 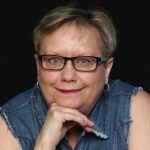 An author and speaker, she is particularly known for the 1914 satirical “Mock Parliament” staged at Winnipeg’s Walker Theatre in which men lobbied women legislators for the right to vote. 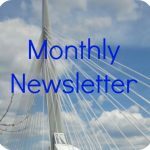 Other featured suffragists include Cora Hind who was Western Canada’s first female journalist, Margrét Benedictsson who founded the Icelandic Suffrage Association in Winnipeg in 1908, Francis Benyon who was a Winnipeg journalist and editor of the woman’s page in the Grain Growers’ Guide, Amelia Yeomans who was a doctor working among the poor and recent immigrants, and Winona Margaret Flett Dixon who formed the Political Equality League and who, with her husband, was active in the labour movement that led to the 1919 Winnipeg General Strike. 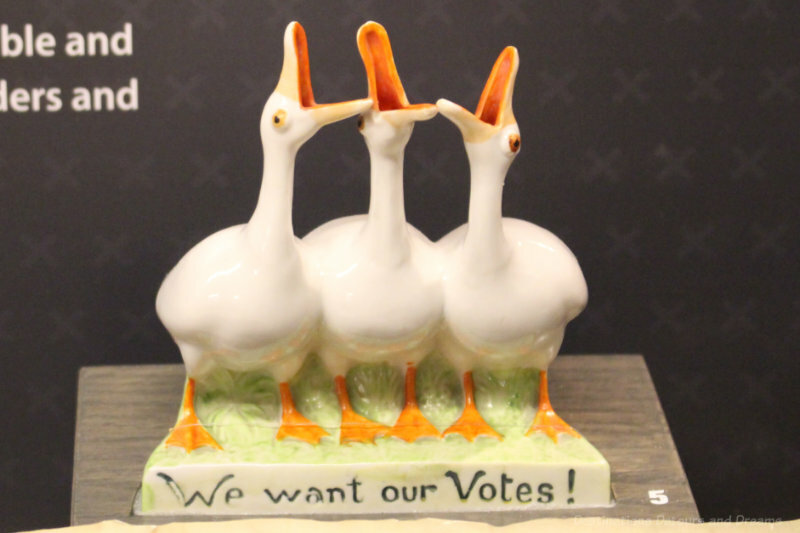 Does this figurine imply women are silly geese asking for the vote? The most outrageous part of this history is that women in Quebec couldn’t vote until 1940. Crazy! Ken, that is indeed outrageous. Ironically, women of Lower Canada had the right to vote from 1791 to 1849.